Can synthetic rhino horns stop the scourge of poaching? Fred Chen, associate professor of economics at Wake Forest University, discusses this possible solution. 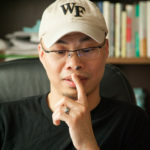 Wake Forest economist Fred Chen takes an interdisciplinary approach to a variety of subjects in his research, applying foundational economic concepts to study topics like animal conservation, epidemiology or biology. Much of his research focuses on examining how human behavior, but his interest in conservation led him to analyze how the creation of synthetic rhino horns can impact rhino poaching. To help save the rhinos from poachers, who covet the rhinos’ horns that can be sold for tens of thousands of dollars per pound, some biotech companies seek to manufacture synthetic versions of rhino horns that are biologically identical to the real thing. They contend that having cheaper synthetic substitutes would lessen the demand for wild horns, thereby reducing poaching levels. Conservation groups, however, are opposed to the development of synthetic horns, for they fear that their availability could increase demand for wild horns by changing how people perceive the use and consumption of rhino horns. The biotech companies interested in making synthetic horns have not been shy about their desire to profit off of their products. However, as my research shows, the goals of rhino conservation and profit-making don’t go hand-in-hand. To make money, biotech companies want greater demand and higher prices for their creations, but driving up horn prices and introducing new products made with synthetic horns—which could lead to the demand and supply of these goods that are made with real horns—are directly in opposition to rhino conservation. Fundamental economic principles tell us that, instead of synthetic horns that are biologically identical to real horns, the availability of synthetic horns that are engineered to be undesirable in some respect to horn consumers, but difficult for them to distinguish from real horns, could collapse the horn market. The uncertainty over the quality of horns for sale caused by the presence of undesirable fake horns could decrease demand, lower prices, and drive out poachers. Of course, no profit-seeking companies would be interested in making a product that would shut down their own market. This is why conservation groups and nonprofit organizations may be better positioned to support the development of the kind of synthetic horns that would save the rhinos.